I'm Phuong and welcome to my blog! Grab a cup of tea, browse around, and have a read. Thank you for stopping by! Three years ago, I decided to do a 365-day project at the start of every year. It's a wonderful way for me to stay inspired and channel my creative energy which is really important to me. I also love that I'm able to complete a beautiful large project just by doing something little every day. It's a great way to think of goals in general where little efforts every day will lead to a rewarding accomplishment at the end. In 2015, I completed a small art project where I drew a little lady with a fun hairstyle every day. It was simple and I was able to keep up with it. In 2016, I wrote a haiku a day for the year. The haiku reflected my feelings and observations of something for the day. It was quite challenging and my haiku are not great but I love them. I wasn't sure what I wanted to do when 2017 approached. I was watching YouTube videos and came across Jen's One Second a Day video. I ended up watching a few more second-a-day videos from other creators (I love this one here and here is one from the original creator). I fell in love with the idea and found my project for the year. Here I am a year later and my video is complete. I get emotional seeing my whole year summed up in 6 minutes. We often only share the highlights of our lives because they are special and are out of our daily routines. The big events or celebrations are nice but they're not what matter the most. I love that this project allows me to remember the little daily moments that I most cherish - the laughs that we get to share, meals that we get to enjoy together, and time for self-growth. Even things that can be mundane or uneventful are quite beautiful because they tell the story of my life. Life will always be full of ups and downs but I appreciate it and feel fortunate that I have wonderful people to share it with. I hope that all of us will be able to spend more time doing the things we love with the people we love this year and every year. Happy 2018! We're lucky to be surrounded by so many wonderful farms. Our favorite ones to visit are Parlee Farms, Honey Pot Hill Orchards, Tougas Farm, and more recently, Applecrest Farm. This year we wanted to explore a few new ones and small farm was one of them. I was excited as soon as I saw "pick your own flowers" on their website. Although we came later in the season, there were still plenty of flowers to pick. 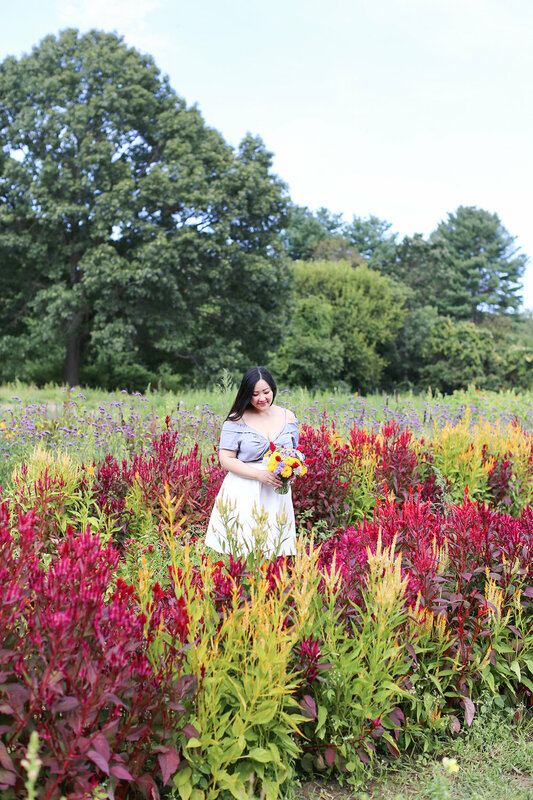 I felt like I was roaming around a field full of wildflowers. I love how whimsical the arrangements can be depending on the flowers that are available. I enjoyed having the time to let my creativity flow. This would be a great place to bring kids or have a fun outing with your friends. It was a fun way to spend a couple of hours and at the same time, support a small local farm. I can't wait to visit again next season! 1. Their season is listed as July to September but call first to make sure. It can be earlier or later depending on the weather. 2. Honey Pot Hill Orchards is just a few minutes away if you have time for another stop. 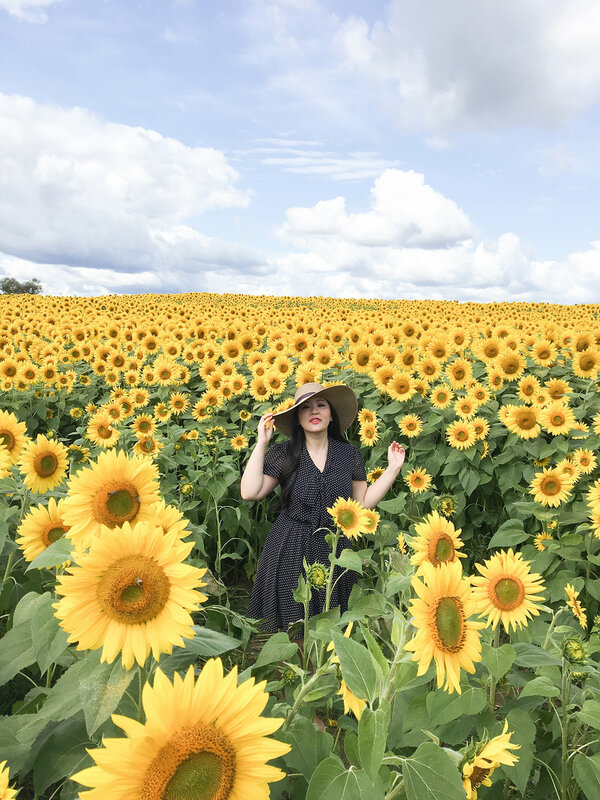 Every year in early September, the sunflower field at Colby Farm puts on quite a show - weather permitting, of course ;) This was our third year visiting. It's a tradition we really love and look forward to. The sunflowers were gorgeous this year and we lucked out with perfect weather. It felt like we stepped into a beautiful painting. This was a random outtake from James' phone camera. My photo outtakes are usually pretty bad with funny faces or weird expressions but I love this one. I love the feel of it. Visiting this beautiful sunflower field is always a highlight for us during September. We already can't wait to go back. I hope you'll have a chance to visit too! 1. Bring bug spray! The mosquitoes are pretty thirsty. 2. Go earlier during the day or go on a weekday to avoid the crowds. This sunflower field has become quite famous over the years. 3. The blooms typically last a week depending on the weather. Call or check their website for current updates. 5. Stop by the farm store to buy fresh locally grown produce and support this wonderful farm. We love visiting nearby farms during the fall (hello apple cider donuts!) but this year we ventured out during the summer for peaches and blueberries. We headed out a bit late on a Sunday and, to our surprise, all of our favorite farms were only opened a half day that day. Luckily, James did a search and found Applecrest Farm. It was our first time picking blueberries and the task seemed daunting at first. 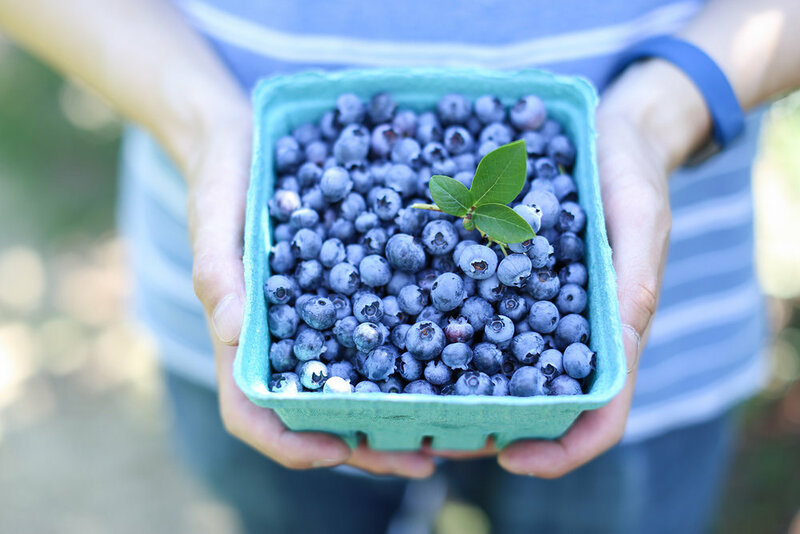 How long will it take us to fill our container by picking each tiny blueberry one by one? James wasn't too excited about it. He was tempted to buy a pint at the farm's store instead. We started picking the blueberries and was amazed when we tasted them. They were floral and sweet - definitely the best blueberries I've ever had. We went to pick peaches next. They were so juicy and sweet. We picked a mix of white (my favorite!) and yellow ones. We ended the day by browsing through their little pick-your-own flower field. It was a lovely way to spend a Sunday afternoon. We can't wait to visit again and also have a meal at their Farm Bistro which looks amazing. Visiting Tip: For pick-your-own, drive to the main entrance where the farm's store is located and purchase the bag/container at the register. Then get back into your car and drive a few minutes down the road to the actual orchard. The set up can be a bit confusing for first-timer. This time last year I was heading to Japan to fulfill one of my biggest dreams. I wanted to explore this beautiful country on my own during the sakura season so that I can photograph and enjoy it at my own pace. It was my first solo adventure and the range of emotions that I had during this trip was pretty incredible. There were moments of extreme loneliness and moments of beautiful quiet reflection. I learned so much about myself. Ultimately, the trip allowed me to celebrate me - who I am as a person and what I like to do without worrying about anyone else. It was an amazing experience. I returned a happier, more appreciative, and inspired person. For me, a big part of life is about continuing to dream, learn, and grow to be the best version of myself. I stay truest to myself whenever I can be creative and bring my ideas to life. That is why I am so excited to finally launch my website! It has been in the works for a while. I love that I can share my love for photography here. I am also ecstatic that I can blog again! I started a blog a few years ago and really enjoyed it. I am looking forward to having this space to learn, share, and cultivate creativity with everyone.